Arsenic (As) is a toxic compound for human health and ecosystems. Some organisms have developed different strategies to live in environments contaminated with arsenic (As-tolerant organisms). Some prokaryotes are able to use arsenic as a donor or acceptor of electrons through respiratory processes (arsenic oxidizer and reducer bacteria). Certain plants can accumulate it in their tissues (accumulative plants) or imply their uptake and favor their exclusion (exclusion plants). Some fungi and bacteria are able to metabolize organic forms less toxic and volatile it. These mechanisms allow plants, prokaryotes and fungi to develop in environments with high concentrations of As. It is known that microbiota (especially rhizosphere and endosphere) can help plants to survive under arsenic stress conditions. 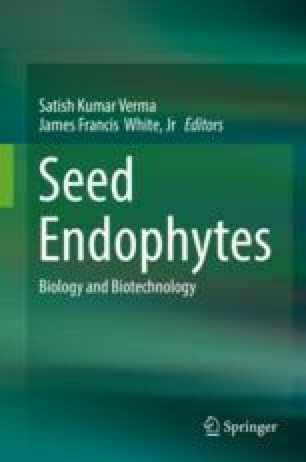 However, little is known about the contribution of seed endophytes in the germination capacity and early development of seedling plants under As conditions. This chapter shows a brief review on the role of endophytic bacteria in the adaptation of plants to As stress conditions. Endophytic bacteria from seeds, obtained from plants that grow in As-contaminated soils, have showed that many of them promote the growth of the plant, have antifungal activity, and are AsV reducer bacteria, with the ability to metabolize arsenic to organic forms. We suggest that they have an important role in germination and early development when the seeds fall into an As-contaminated environment. The authors thank Dr. M. Bergen (Rutgers University) and Dr. S.K. Verma (Banaras Hindu University) for his invaluable help and collaboration. Molina, M.C. greatly thanks Rutgers University for her time there as a Visiting Scientist.